The soaring Source Hotel may be an instant icon. Photo credit: Stephan Werk Media. The Source Hotel, that is. I put Stephen Dynia on the spot by asking him if he thought the soaring Source Hotel in the River North Art District would be considered an iconic building. ”I hope it is,” replied the architect, principal of Dynia Architects and the designer of the $50 million, 100-room hotel at 3300 Brighton Blvd. The Source Hotel marks the 11th building that Dynia has designed for Zeppelin Development. Zeppelin is the owner and developer of the Source Hotel. 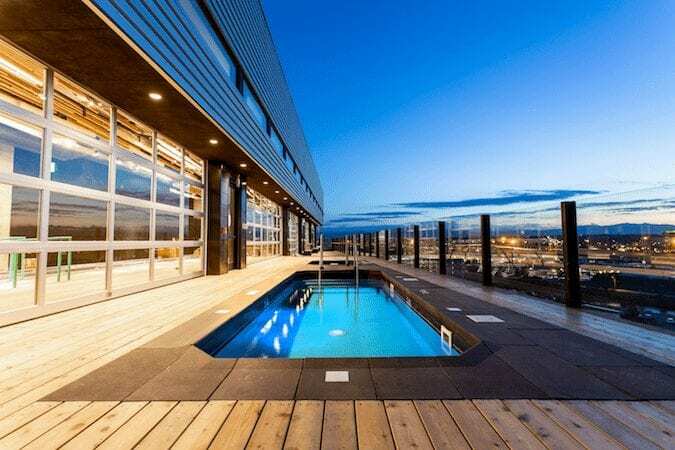 A rooftop swimming pool, where you can enjoy a fresh-brewed beer from the New Belgium Brewery, will be one of the amenities at the Source Hotel. Photo credit: Stephen Werk Media. “Obviously, I am biased on that,” Dynia quickly answered. 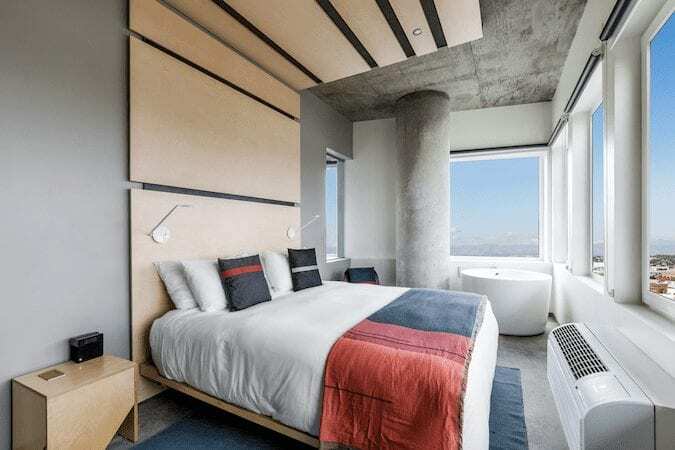 When the Source Hotel opens, in September at the latest and possibly even next month, the eight-story building that is as tall as a typical 10-story building (due to the floor-to-ceiling height in two stories) will be the largest hotel in RiNo. It was the first hotel announced in RiNo, but the smaller Ramble Hotel at 1280 25thSt. already has opened its doors. 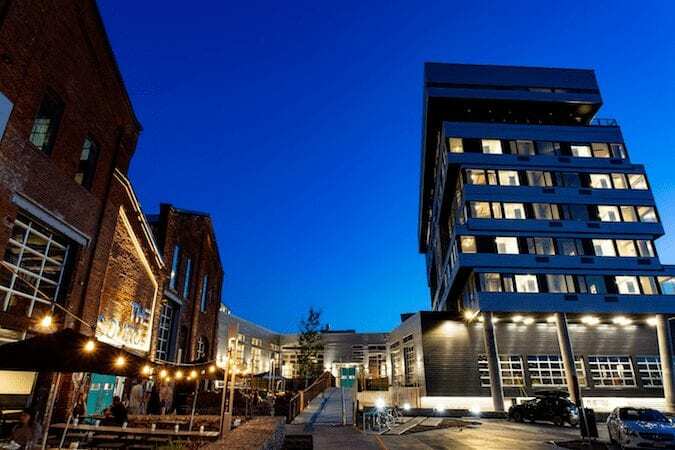 There was never any attempt to make the Source Hotel mirror the look of the original and adjacent Source building, a converted brick warehouse built in the 1880s that Zeppelin converted into a popular food hall marketplace and retail gathering place. The Source Hotel also will include its own marketplace. “The design of the hotel by Stephen Dynia references to the Source building and the industrial history of the neighborhood,” said Justin Croft, a partner at Zeppelin. “But you don’t want to try to replicate a 140-year-old building,” as that would not appear authentic, Croft said. Yet, by using galvanized metal, brick and concrete, the Source Hotel references the industrial history of the area. Both Dynia and Croft admit that RiNo is primarily a neighborhood of low-rise buildings. 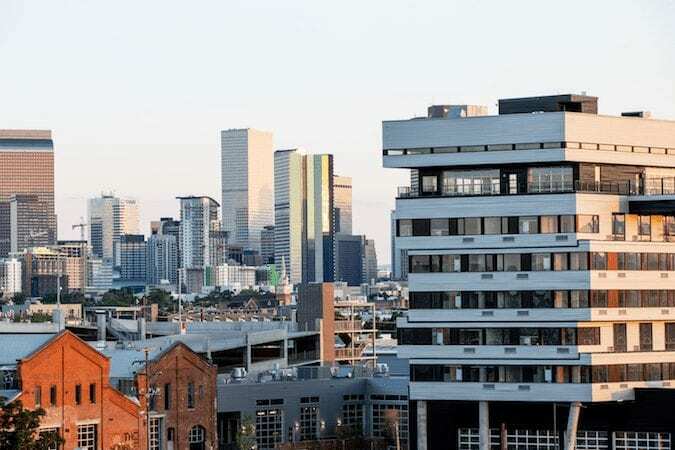 And although there are some 12-story buildings on the drawing board in RiNo, the Source Hotel seems to have escaped the scathing criticism that the owner of Larimer Square received when he floated the idea of building new, tall buildings next to the buildings in the Larimer Square Historic District. That said, Dynia angled the building in a way to help mitigate the height contrast from not only the Source but also other buildings in the area. “It’s really almost more like having eight one-story buildings rather than an eight-story building,” he said. He also incorporated 17 garage doors – a Zeppelin signature – into the building. 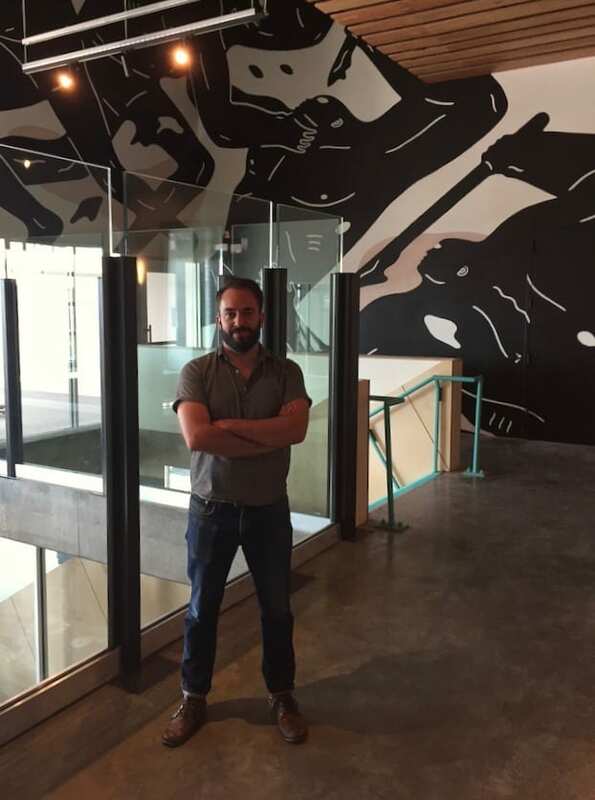 Justin Croft stands by a 780-square-foot mural by LA urban artist Cleon Peterson covering three walls in the Source Hotel. “Initially, we wanted to do twice that number,” Dynia said, but he backed off because he feared the wind would rattle garage doors on the west side. Still, garage doors are seldom part of the design palate of a hotel, especially a new, modern one like the Source Hotel. And those 17 garage doors are only the ones that Dynia incorporated into rooms, which will start at $249 a night. Croft’s favorite space in the Source Hotel, the 6,000-square-foot, long-anticipated Safta restaurant, is lined with garage door windows. Safta will serve modern Israeli cuisine by chef Alon Shaya, a James Beard award winner. Both Dynia and Croft, in separate interviews, sounded like they were reading off the same script when they talked about the importance of the garage doors in Safta. “When you open those garage doors, it feels like you are bringing the outside in,” they agreed. 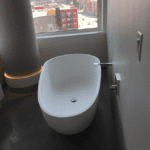 In addition to garage doors, some bedrooms in the Source Hotel will include bathtubs. Like the Safta, the Source Hotel will have a certain international flair. That’s fitting in a neighborhood that is generating publicity not only nationally but worldwide. “Our councilman, Albus Brooks, told me when he was at an economic development visit to China, the most frequent question he got while there was about what is happening in RiNo,” Croft said. While the exterior materials reference the industrial past of RiNo, the extensive use of Baltic birch throughout the rooms and interiors helps provide a light, airy ambiance. The Source Hotel also will feature one of the most cutting-edge amenities – an actual brewery just off the lobby. Separated by glass from the lobby, New Belgium Brewery will produce sour, wild and experimental beers from its inaugural brewery. The brewery amenity even received a recent shout out from the New York Times. 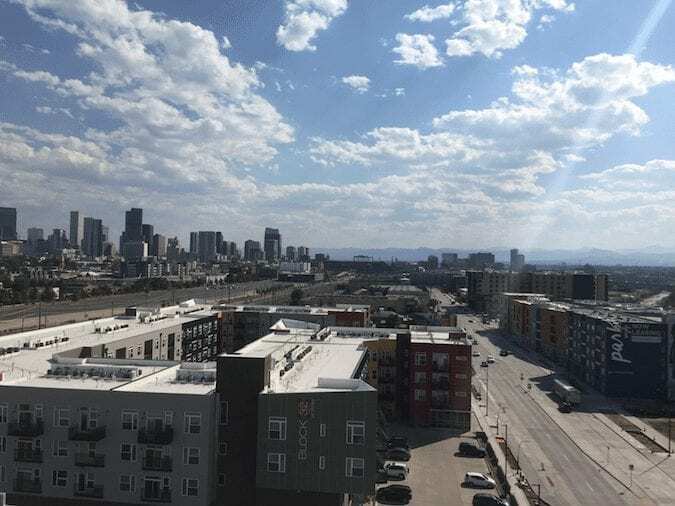 While you can get a complimentary glass of beer when you check in, the 10-barrel brewery will serve beers on the rooftop deck, which includes stunning views of Denver’s skyline. The top floors also will have a hotel-operated restaurant, the Woods. Generally speaking, the Source Hotel would be considered a “lifestyle hotel,” Croft said. 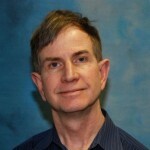 “That’s kind of an over-used term,” Croft said. “But often, these so-called lifestyle hotels can be kind of gimmicky, and while the best of them serve good food and have a cool vibe, they typically have pretty mediocre service,” Croft said. Zeppelin addressed that last issue by hiring the independent group that operates the St. Julien Hotel in Boulder to run the Source Hotel. “St. 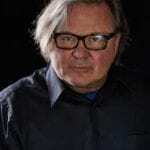 Julien has just a legendary commitment to hospitality and service,” Croft said. In addition to the hotel’s design, another artistic feature that will make the Source Hotel stand out is a 780-square-foot graffiti mural covering three interior walls and 20 feet high at some points. The mural, by Los Angeles urban artist Cleon Peterson, is titled “Endless War.” The mural’s clashing figures, in case it is not obvious to you, symbolize the struggle between power and submission in the fluctuating architecture of contemporary society. Croft said he thinks Dynia’s design of the Source Hotel will withstand the test of time. “It’s really almost a sculpture,” Croft said.